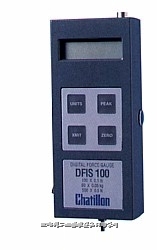 The DFIS Series digital force gauge is extremely easy to setup, operate and maintain. Using a simple four push button membrane keypad, users can quickly access peak values, reset zero, tare and select engineering units in lb, kg or N. A large, easy-to-read LCD display displays current values, peak values, gauge settings and battery status. The DFIS samples at 1000Hz and includes a bi-directional RS232 serial data output and a modified BCD Mitutoyo output. The RS232 allows you to interface your gauge to a motorized test stand operating with our NEXYGEN?automation software for a complete, economical testing system. Each DFIS Chatillon force gauge comes with a carrying case, battery charger, removable load cell shaft and a set of stainless steel attachments- flat, hook, cone, chisel, v-notch and extension rod. Die cast metal reversible housing. Split housing design permits upright display whether gauge is hand held or test stand mounted.